FroBunni: Dear FroBunni: How should I wear my hair during an interview? Dear FroBunni: How should I wear my hair during an interview? "Dear FroBunni, I am looking for a new job, and I really want to make sure I have the best chance of getting a job. Even though I love my natural hair, I don't think my natural hair will be well received at an interview. Should I straighten my hair or wear it as is?" I get this question a lot, and in my opinion, I don't think your natural hair is going to matter that much. I know many naturals think that their hair isn't appropriate for the corporate world, but I think that is more so due to their own self consciousness. 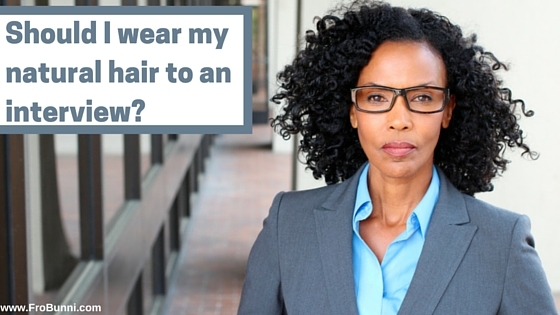 The only thing that will matter in an interview is HOW you wear your hair. You don't want to go in an interview with a frohawk or high volume, big hairstyle. You want your qualifications to shine during the interview, not your hair. TWA Just make sure hair is clean and well moisturized. If your hair is a little longer and you have hair falling in your face, just pin it back. Medium Hair This stage is a bit more difficult because you probably can't yet get all of your hair in a ponytail. Try a flat twist going from the front of the head to the nape of the neck and gather the rest of the hair in a low ponytail. Or even try a half up-half down hairstyle gathering the top half of your hair into a ponytail or bun. You just want to make sure all of your hair is out of your face. Ponytail or bun (and not a topknot). At the end of the day, make sure that you are happy with how you look during the interview. The most important thing is to be comfortable, and if you are constantly worrying about your hair instead of focusing on the interview, it may just be best to straighten your hair or wear a wig. Your welcome! Glad I could help! The Best, Shortest Workout Routine Ever! Dear FroBunni: How do I get Second Day Hair? 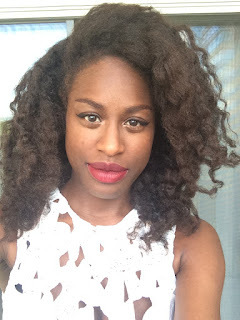 Check out my Natural Hair Feature on Frolicious!